The Spanish company Blusens presents another PMP, the Blusens P27. The P27 has a 2.4-inch screen and can play video files in AVI and MPEG formats, audio files in MP3 and WMA, and also show JPG pictures. The P27 has a FM tuner, and it’s really small, measuring 2.56 x 1,97 x 0,39 inches, and weighting only 51 grams. 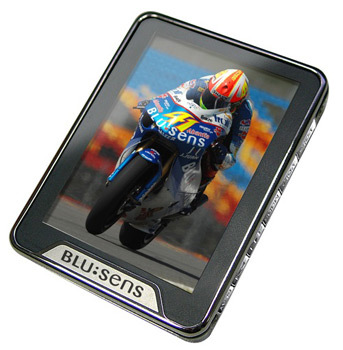 The screen can show up to 260.000 colors, and the Blusens P27 has an internal memory of 1 GB that you can expand using the miniSD slot. There are other cool features such as a microphone so you can record your voice notes anywhere you wish, and integrated speakers so you can hear them as well. The Blusens P27 comes with a lithium battery, AC adaptor, stereo headphones, USB cable, user manual and software to convert the videos. It will be sold in Spain for about 90 Euros. Not a bad looking PMP, although sounds like it will still be more expensive than a PSP (yes, I’m a fanboy). The screensize looks a bit strange too, taller than it is wide. Does anyone know if you can choose to display videos in either direction? EEJ, I think the above image is just an example, the videos will actually play in landscape mode. P.S. I’m also a fanboy of the PSP.